Tim Cook is seriously underrated. Seven years after taking over as CEO from Steve Jobs, the narrative that he’s riding his predecessor’s coattails needs to change. It’s just not true. Cook is his own man, transforming Apple in his own way. See Monday’s Apple credit card and subscription News+ app as examples, which are centered on customer privacy, a big Tim Cook mandate. The company today is a better corporate citizen than it was in the past. And as a business, it’s firing on all cylinders. Cook is doing almost everything right. Some pundits are beginning to argue he’s Apple’s best CEO yet. 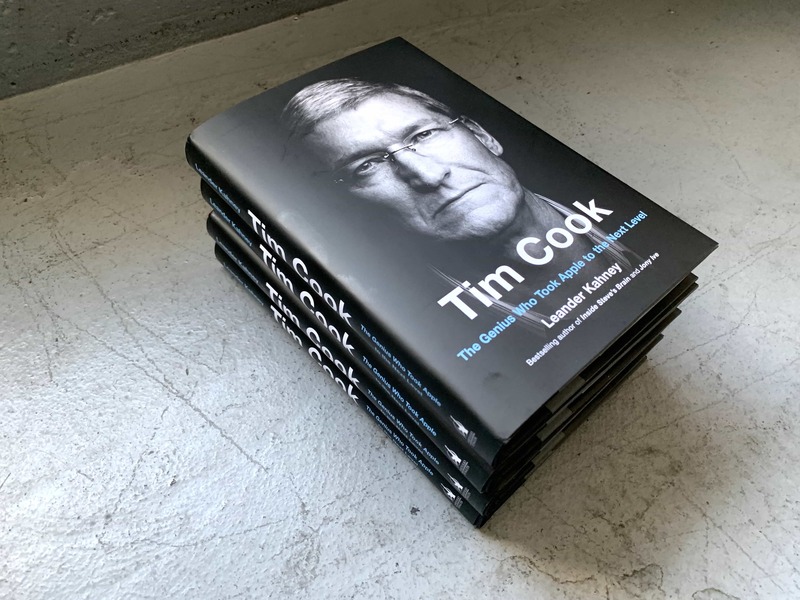 Here’s what to expect from my upcoming book, Tim Cook: The Genius Who Took Apple to the Next Level, which will be published April 16. As far as I know, Tim Cook is the first full-length biography about Apple’s CEO. I recieved a lot of help from Apple, which made some of Cook’s executive colleagues available for interview. As a result, I got an exclusive insider’s account of how Cook dealt with Apple’s standoff with the FBI over unlocking the San Bernardino shooter’s iPhone, among other things. 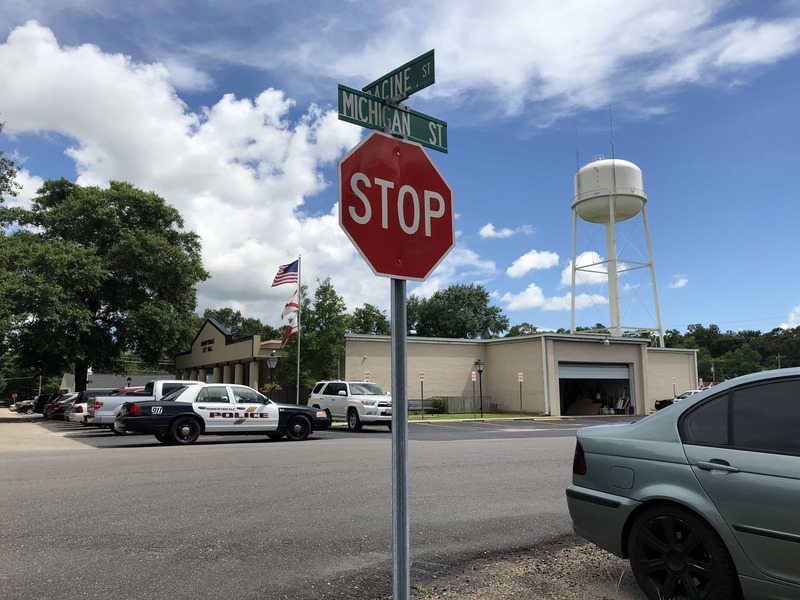 The courthouse in the middle of Tim Cook’s hometown: Roberstdale, Ala. The book starts with Cook taking over from Jobs. Then it backtracks to Cook’s childhood in rural Alabama. Cook’s experience seeing racism and discrimination in the Deep South, heightened by his being gay, had a deep influence on the kind of CEO he’d be at Apple. The book looks at his education and early career at IBM, a company that pioneered just-in-time manufacturing by essentially making computers on demand. It proved an important apprenticeship. That’s where Cook learned the expertise he would bring to Apple. In the late 1990s, Jobs recruited Cook. After returning to Apple, Jobs was desperately trying to save the company, which was on the verge of bankruptcy. A big part of the job was fixing Apple’s manufacturing operation, which was a mess. Cook came aboard, quickly took control and turned things around. His contribution played a big part in saving Apple, but he doesn’t get much credit for it. With Apple on firmer footing, Jobs started introducing a string of hit products — the iMac, the iBook, the iPod. Each was a bigger and bigger hit, and soon Apple was selling products in really, really big numbers. Cook’s expertise in manufacturing and the supply chain led him to build a giant manufacturing operation. By using outside suppliers like Foxconn, Apple could build millions of products in the utmost secrecy and deliver them all over the world. It laid the stage for the Apple’s most popular product, the iPhone. Internally at Apple, Jobs groomed Cook to take over from him. He gave Cook a succession of jobs and more and more responsibility. In 2005, Cook became Apple’s COO — and Jobs’ right-hand man. In fact, around this time, Cook became Apple’s de facto CEO, running Apple behind the scenes. He did it so well, it freed up Jobs to concentrate on what he liked doing best — helping develop new products with Jony Ive in Apple’s industrial design studio. 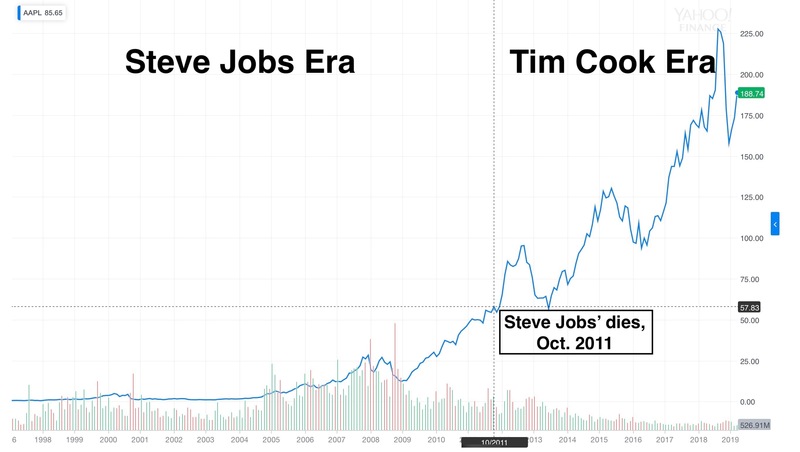 When Jobs passed away from cancer in 2011, Cook officially became Apple’s CEO. It must have been the worst job in the world. If you remember that time, there was a huge outpouring of grief for Jobs. It must have been terrifying for Cook. Who’d want to be in his place? Who’d want to take over from a business and cultural icon? Cook had the biggest shoes to fill in American business. How do you follow someone like Steve Jobs? The likelihood for failure was huge. Cook was a boring operations guy. He might make the trains run on time, but he couldn’t drum up the same excitement and passion as his predecessor. And without Jobs, where would the next generation of Apple products come from? Most pundits predicted spectacular failure. Apple’s market cap for the last twenty years. Most of Apple’s ~$1 trillion valuation was earned in the Tim Cook era. But Cook proved them wrong. He turned out to be a very worthy successor. Apple today looms much, much larger than it did at the time of Jobs’ death. Profits have soared. Apple’s stock is through the roof. The company is worth more than three times it was when Jobs died (it was then worth $300 billion). Under Cook’s watch, Apple became the first company in history to be worth more than a trillion dollars. Almost everything Apple does is a bigger than ever — computers, smartphones, tablets and services like Apple Music and iCloud. The iPhone continues to be the best business ever invented — it’s huge, and it just keeps making mountains and mountains of money. Some people ask, can Tim Cook innovate? I say yes. Take the Apple Watch, the first product to have no input whatsoever from Steve Jobs. The Apple Watch is a sleeper hit. It’s already bigger than the entire Swiss watch industry, and is by far the most popular smartwatch on the planet. It spawned a whole new wearables industry. And, like all of Apple’s products, it will only get better with time. Or what about AirPods, Apple’s wireless earbuds? They became another big hit. People love them. There are even bigger things on the horizon. Apple is developing a self-driving car, which, despite the rumors, seems to be a very, very big project that is still on track. If Cook delivers, Project Titan has the potential to rewrite not just transportation, but urban planning, tourism, real estate and a whole bunch of other things. Cook has been transformative inside Apple. He’s turning Apple into a kinder, gentler money-making machine. Under Cook, Apple is more charitable. It’s a better corporate citizen. His initiatives in green energy are truly big and important. Apple runs on 100 percent renewable energy worldwide, and is working to bring along its supply chain, too. It’s building a lot of solar and wind power facilities, and owns its own sustainable forests for packaging. The company also removed a ton of toxins from its products and manufacturing processes. Cook also continues to work hard to make Apple more diverse and inclusive. Apple already leads its Silicon Valley rivals when it comes to employing women and people of color. It’s a slow process — so much relies on staff turnover. Folks need to quit or retire before they are replaced, so it’s a process that can take years. Cook also has done a lot for accessibility. The iPhone packs some pretty remarkable technology that allows completely blind people to use it. Apple’s products routinely win awards and plaudits for being accessible to everyone. And Cook is one of the leading advocates for consumer privacy, which has become one of the touchstone issues in tech. His stance is in stark contrast to that of companies like Facebook. Cook is also helping to transform Apple’s supply chain. After a rash of worker suicides, it earned a terrible reputation for exploitation. But under Cook, Apple has almost completely eradicated the worst violations — things like child labor, forced overtime and bonded labor, where workers are required to work to repay a debt. 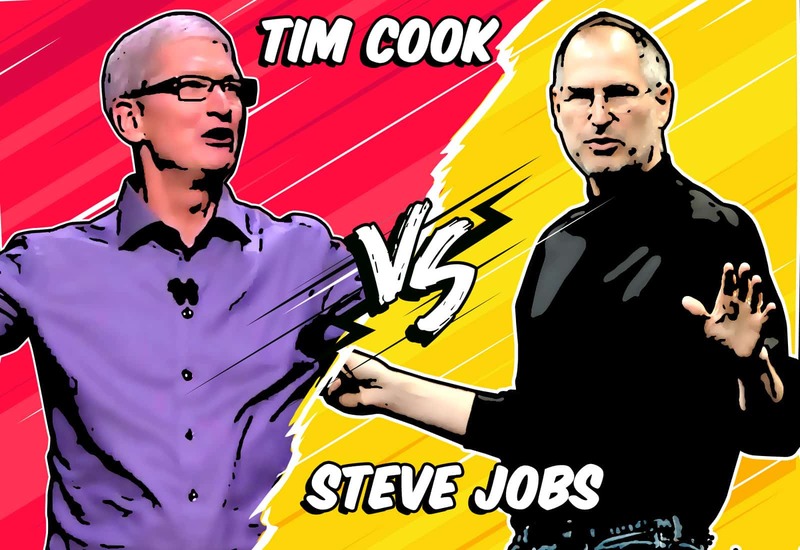 Is Cook the best Apple CEO ever? Since taking over as Apple CEO, Tim Cook has hardly put a foot wrong. Yes, Apple rightly faces criticism for elaborate offshore tax schemes that some call tax dodging. And there’s still a long way to go to build a more diverse workforce, and a less exploitative supply chain. But one pundit I talked to call Tim Cook the best CEO Apple ever had, even better than Steve Jobs. I know this is an outrageous thing to say, but read the book. You might agree. 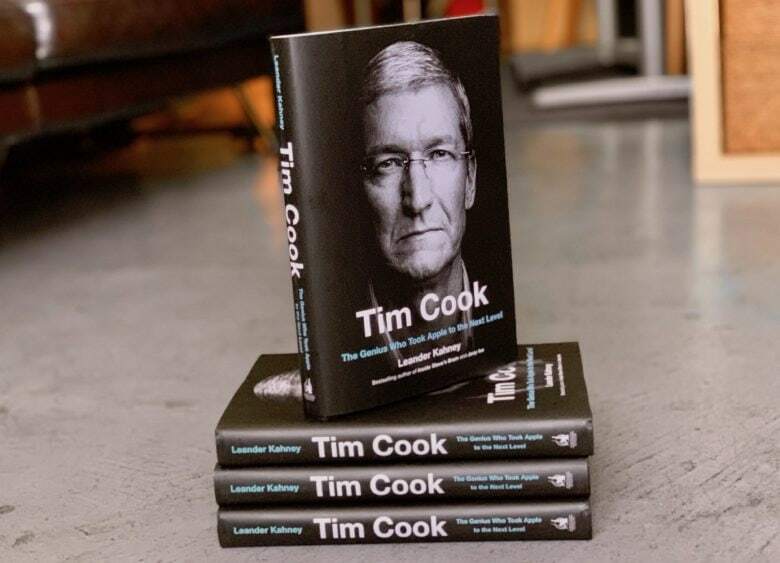 Leander Kahney’s new book, Tim Cook: The Genius Who Took Apple to the Next Level, will be published on April 16. You can preorder the book from Amazon.